US equities indexes closed moderately mixed, sp +0.7pts @ 2169. The two leaders - Trans/R2K, settled higher by 1.1% and 0.6% respectively. 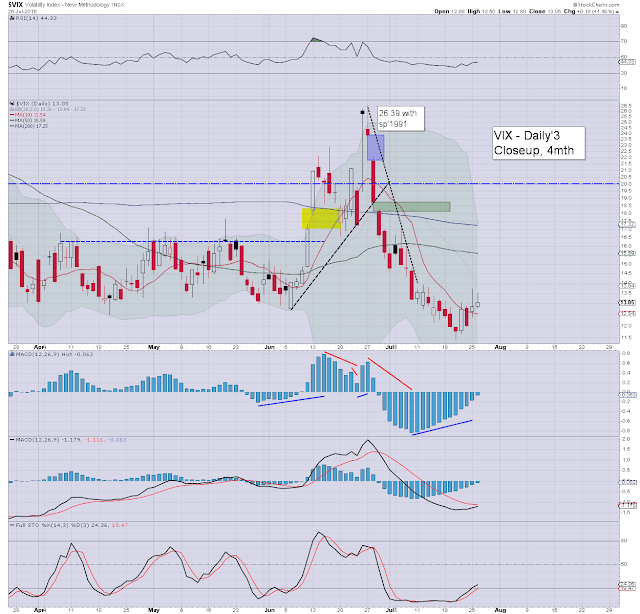 VIX settled +1.4% @ 13.05. 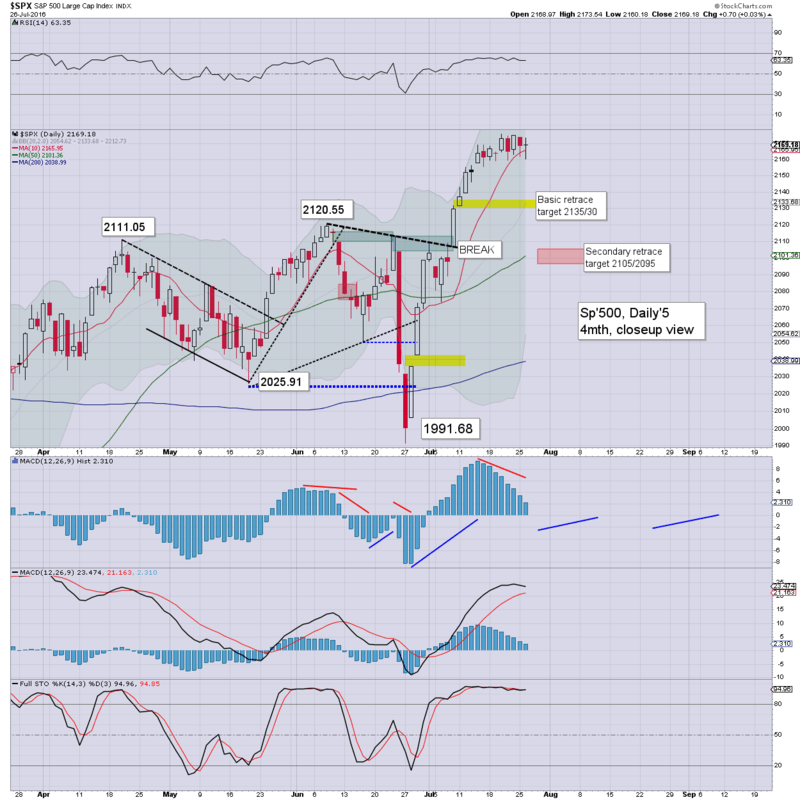 Near term outlook threatens (at best) a test of the 2130s, but regardless... the sp'2200s remain due. A pretty subdued day in market land. It was notable that the two leaders were pushing higher, with the Transports provisionally confirming price structure of a bull flag. VIX remains broadly subdued, with the key 20 threshold likely out of range until at least mid/late September. Cyclically speaking, equity bears could argue for a break lower tomorrow afternoon, and into month end/early August. Yet, the past nine trading days have likely just been 'consolidation across time', before the next push higher in August. 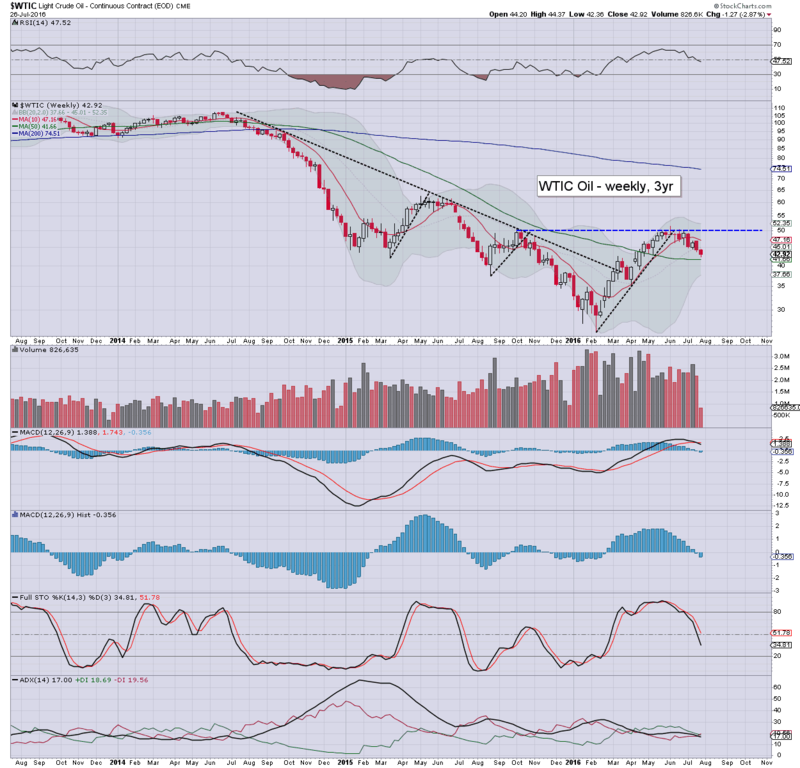 A fourth consecutive net daily decline, -0.5% @ $42.92. Bearish chatter continues to increase, with talk of the mid $30s. Yet... equity prices are far more suggestive that oil prices will 'somehow' settle the year closer to $60 than $40.. nevermind the $30s. The FOMC will issue a press release Wed' @ 2pm, there will not be a Yellen press conf'. There is higher probability of a 10km wide asteroid landing in the Pacific ocean tomorrow afternoon than the US fed raising rates. What will excuses 447, 448, and 449 be, to justifiy not raising rates? I'm sure most of you can think of as many as I can. As things are, the next realistic chance of the Fed raising rates - by a monstrous 25bps to a target range of 50/75bps, will be the Dec'14 meeting. and that is twenty weeks away. For others - notably UK savers, rates are set to be cut, with business people being issued with threats of possible charges being implemented by year end. Clearly, the world economy just gets better with each day, and that is why we need rates to remain at emergency levels. Is it time for the 100 meter hurdles in Rio yet?